A smaller, mini-motion version version of Sega's popular racing game. The game is linkable up to 4 players, with players racing across a variety of different terrains including snow, mud, and dirt. The cabinet features a motion base. There are 2 game modes players can choose from. In "Race Mode", players race against their rivals and other computer controlled cars, with a total of 20 cars each vying for top spot in this action-packed mode. In "Time Attack Mode", the player races alone for the best time. There are four different courses available, each with a different difficulty - Bluster Canyon for beginners, Isolated Jungle for intermediate racers, Calibou Valley for advanced racers, and Industrial Hill for professional racers. There is a boost button adding to the fun of racing, with players filling up the boost gauge by destroying obstacles and then unleashing their boost to pass their rivals at top speed. The game incorporates Sega's "Driver Change System". 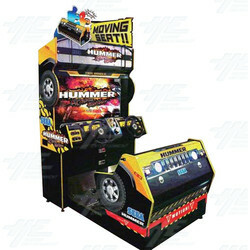 2 Players can sit onboard the Hummer for co-operative play, with the driver changing according to the timing of checkpoints and contact with cars. Not knowing which driver's turn it's going to be provides enhanced player excitement, and a review of the player's teamwork is posted on screen for player review after the race ends. There are 2 game modes players can choose from. In "Race Mode", players race against their rivals and other computer controlled cars, with a total of 20 cars each vying for top spot in this action-packed mode. In "Time Attack Mode", the player races alone for the best time. There are four different courses available, each with a different difficulty - Bluster Canyon for beginners, Isolated Jungle for intermediate racers, Calibou Valley for advanced racers, and Industrial Hill for professional racers. There is a boost button adding to the fun of racing, with players filling up the boost gauge by destroying obstacles and then unleashing their boost to pass their rivals at top speed. The game incorporates Sega's "Driver Change System". 2 Players can sit onboard the Hummer for co-operative play, with the driver changing according to the timing of checkpoints and contact with cars. Not knowing which driver's turn it's going to be provides enhanced player excitement, and a review of the player's teamwork is posted on screen for player review after the race ends.